Character students for January at Reeds Spring Intermediate School were recently announced. Pictured above are the fifth graders recognized for demonstrating the characteristic of commitment. From left to right, they are Kaylee Sipe, Blayn Cook, Skyler Hart and Nathan Mitchell. Not pictured is Bobbee Carlile. 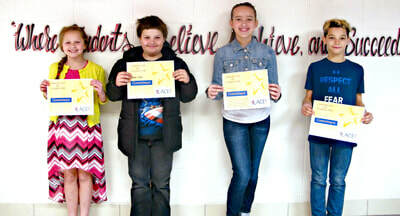 Sixth grade students at Reeds Spring Intermediate were also recognized as character students. They were, from left to right, Devan Wolfe, Aubree Davis, Taylor Yartz, Sage Grant and Dahlia Brand.